Hey, Christmas is even in the title! This totally counts! I love Nature. Even if you don’t, I recommend you watch the first part of this. It has one of my favorite scenes that has ever been on Nature or any other nature program, ever. It’s the part with the fox. I love it. I’m not going to tell you more. The rest of the program is great too. 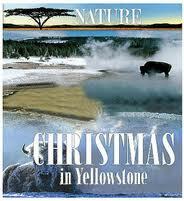 It follows animals searching for food and shelter in Yellowstone National Park in the dead of winter. Bison, elk, wolves, bears, birds, otters and humans all make appearances. I was actually surprised how much I liked following the photographer Tom Murphy as he showed how he camps out in the snow, both to get amazing photos and just because he loves the area. The scene with the people who came out with telescopes to look for wildlife on Christmas day was pretty fantastic as well. The narration tips over the edge into pretentious once or twice. By and large I’m willing to overlook silly narration in a good documentary, but the bit about the solstice was painfully corny. The film is so gorgeous, though, that those annoyances slide right off. It’s incredible to realize that those geysers are real. You can practically smell the snow coming off the mountains. Watching wolves lope over the countryside crystallizes the potential for peace and beauty in this time of year. Besides, seeing otters in snow is always worth your time. Settle into a warm blanket for this one. Or if you just want the cute fox, I guess I can give you that link too.